YOU CAN’T AFFORD TO MISS THIS SALE! Aphrodite got overstocked over the past year. And now we are moving all of this fabulous inventory out at the lowest prices imaginable! The store is packed with our best labels from all seasons – from summer tank tops to winter coats and everything in between. Current winter stock is 20 – 50% OFF! Everything else is 50 – 75% OFF! Our year round Sympli line will be 20% OFF until the end of January as is the Yummie Tummie line. Hue leggings are 10% – 50% OFF! For a short time only a good lot of our jewellery is on sale at 20% OFF! Honestly folks, it doesn’t get better than this! 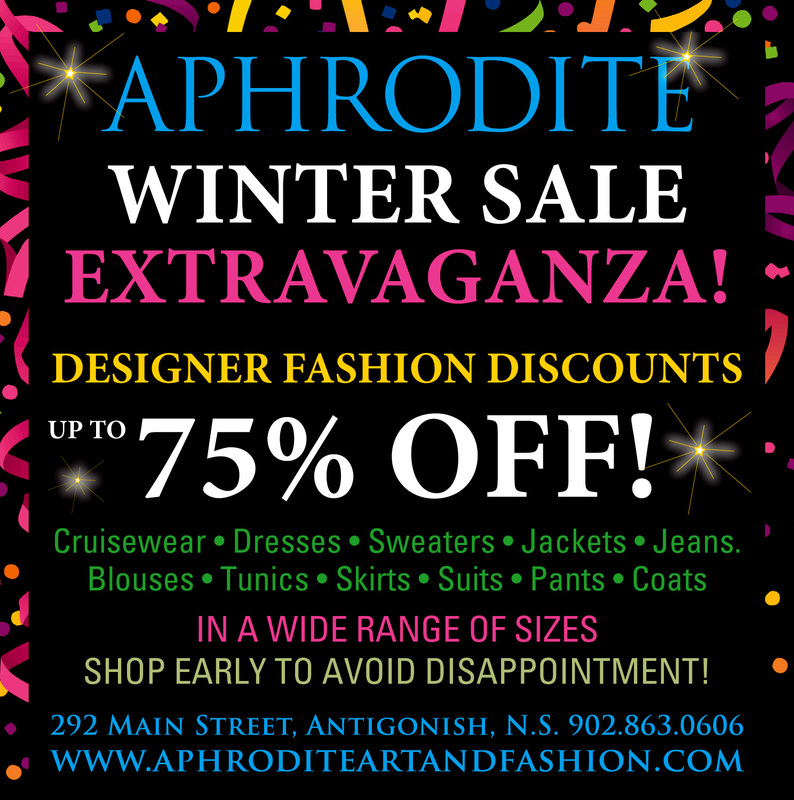 The sale launches Tuesday, January 20 and lasts through to the end of February when our new 2015 Spring fashions start arriving. We are blitzing this campaign with radio and print ads throughout the Strait region. Tell your friends! Bring your friends. Like us on Facebook! Every day for the next two weeks we will send you photos of some of the looks that are available – ON SALE!!! Here’s some to get us started…..
I’ll send you some more tomorrow! See slideshow for details on each outfit.